Cambridge Construction has been the Main Contractor on all the below contracts. All contracts have been completed on time and on budget. All standards were adhered to and exceeded resulting in a quality product and a very pleased Client and Engineer. 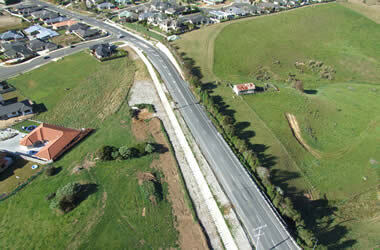 Project Location: Borders Belmont Road and Adams Road on the south western side of Pukekohe CBD. Project Period: 58 Weeks, completed August 2017. Project details: This Project involved constructing a 170 Lot Residential subdivision on Belmont, Pukekohe. 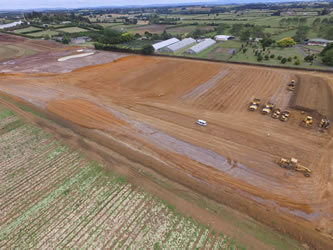 Works included 80,000m³ of earthworks. 3,000m of Concrete Stormwater pipes. 2,000m of PVC Wastewater pipes. 4,000m of Kerbing. Services laid to the boundary inc water, power and fibre. 22,000m² pavement construction inc footpaths. The construction of a permanent storm water pond. During this project we maintained an excellent environmental compliance record with the Auckland regional council. 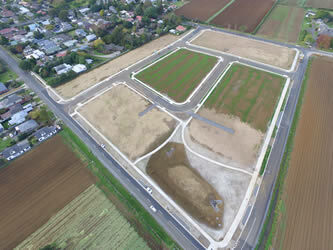 Project Name: Belmont Heights Stage 2: 74 Lot Residential Subdivision. Project Location: Borders Jutland Road and Adams road on the south western side of Pukekohe CBD. Project Period: 34 Weeks, completed September 2016. 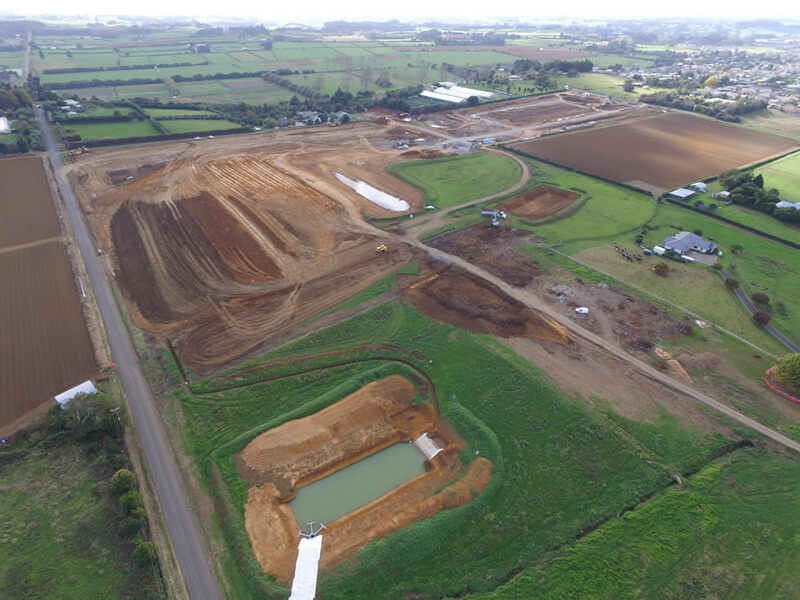 Project details: This Project involved constructing a 74 Lot Residential subdivision on Jutland Road, Pukekohe. 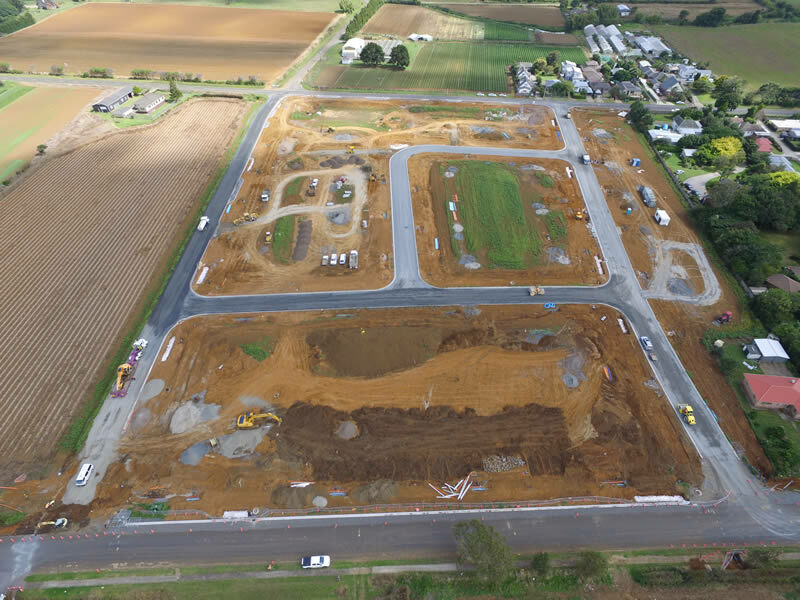 Works included 48,000m3 of earthworks; 16,500m3 Material cut to waste; 1,600m of Concrete Stormwater pipes; 1,800m of PVC Wastewater pipes; 1,700m of Kerbing. 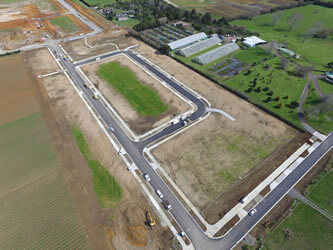 Services laid to the boundary inc water, power and fibre; 11,000m2 pavement construction including concrete footpaths; Constructing a permanent storm water pond. 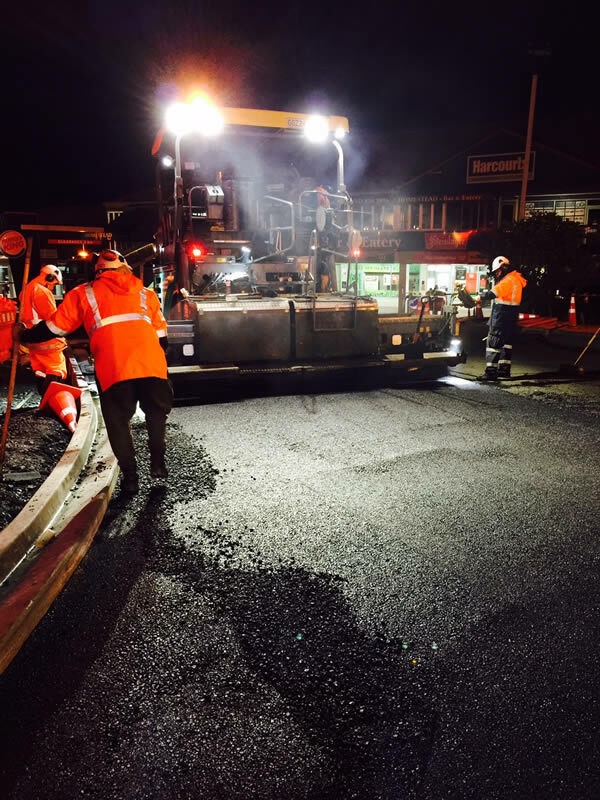 During this project we maintained an excellent relationship with the Client, the Engineer, Auckland Council, and the Auckland regional council. 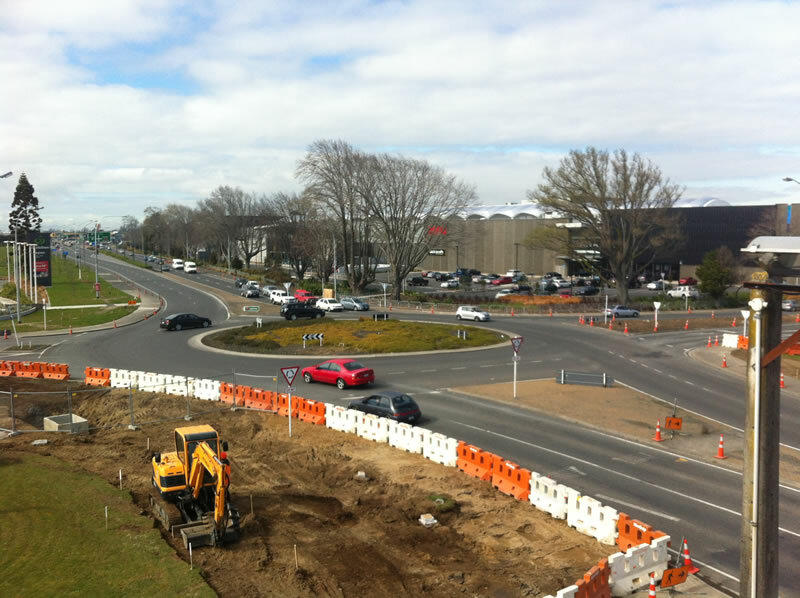 Project Location: Borders Victoria Street West and McNally Road on the south western side of Pukekohe CBD. Project Period: 30 Weeks, completed April 2016. 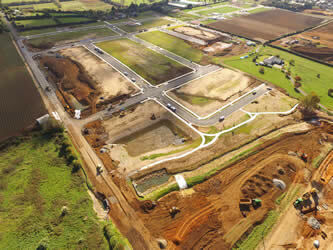 Project details: This Project involved constructing a 70 Lot Residential subdivision on Victoria Street West, Pukekohe. 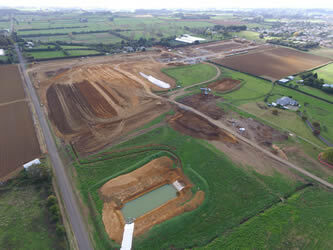 Works included 40,000m3 of earthworks. 1,700m of Concrete Stormwater pipes. 1,500m of PVC Wastewater pipes. 2,200m of Kerbing. Services laid to the boundary inc water, power and fibre. 12,000m2 pavement construction inc footpaths. The construction of a permanent storm water pond. 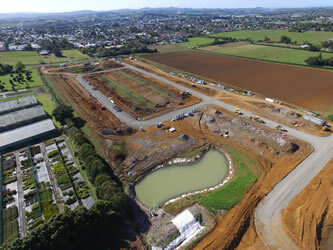 During this project we maintained an excellent environmental compliance record with the Auckland regional council. Project Location: Hamilton City - SH1 Cambridge Rd / SH26 Morrisville Rd. Project Period: 14 Weeks, completed November 2015. 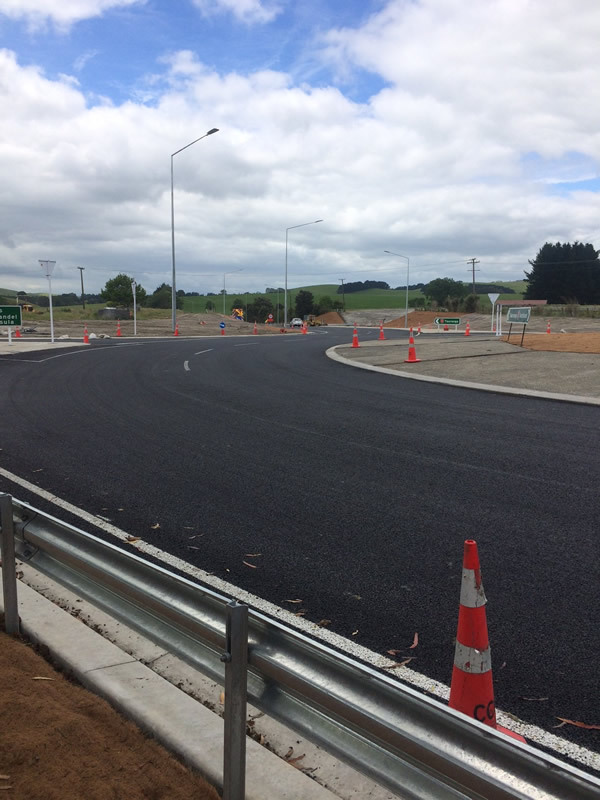 Project details:This Contract was undertaken on the busy intersection of SH1 and SH26 in the suburb of Hillcrest in Hamilton. The traffic count averaged 36,000 vehicles per day. The completed project resulted in a safer more efficient road network for vehicles, pedestrians and cyclists. Construction included additional traffic lanes for traffic heading into and exiting Hamilton City. Works also include upgraded footpaths, entrance ways, signage, street lighting and safety barriers. 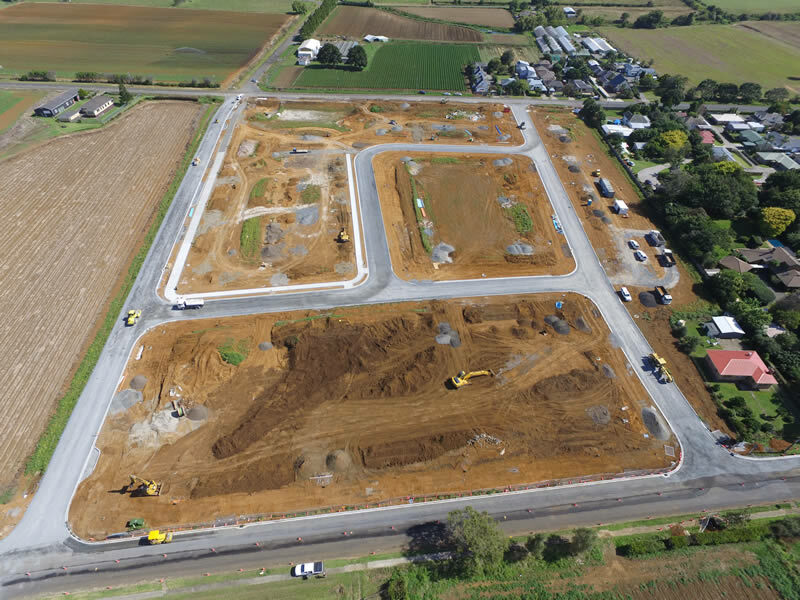 Cambridge Construction and NZTA were well aware for the need for businesses to trade profitably during construction and assisted by communicating regularly with all the local business owners as work proceeded in turn accommodating any special requirements. We also ensured that construction noise was kept to a minimum and that clear access to all property with in the work area was maintained during the construction period. There were minimal traffic delays due to construction and the contract was completed on Budget and 2 weeks ahead of programme. Project Location: SH2, 12km East of Maramarua. Project Period: 16 Weeks, completed December 2014. 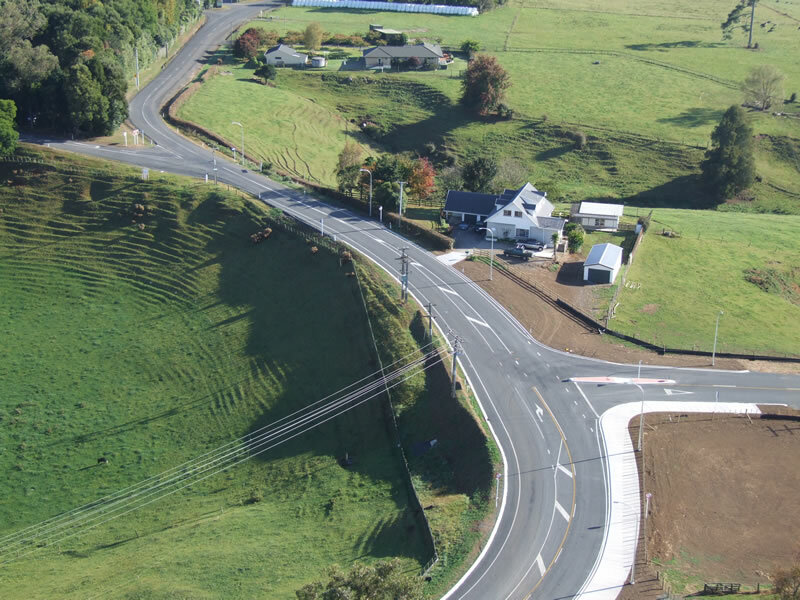 Project details: This Contract was undertaken on the busy intersection of SH2 and SH25. The contract involved overlaying the existing tee intersection with a 3 way roundabout. The roundabout carriage way was constructed of structural AC and the approaches consisted of a cement stablised basecourse. The vehicle count 13,000 average per day with very heavy weekend traffic counts due to comuters heading to coastal areas from the greater Auckland area. There were minimal traffic delays due to the roundabout construction. Project Period: 32 weeks, completed June 2014. 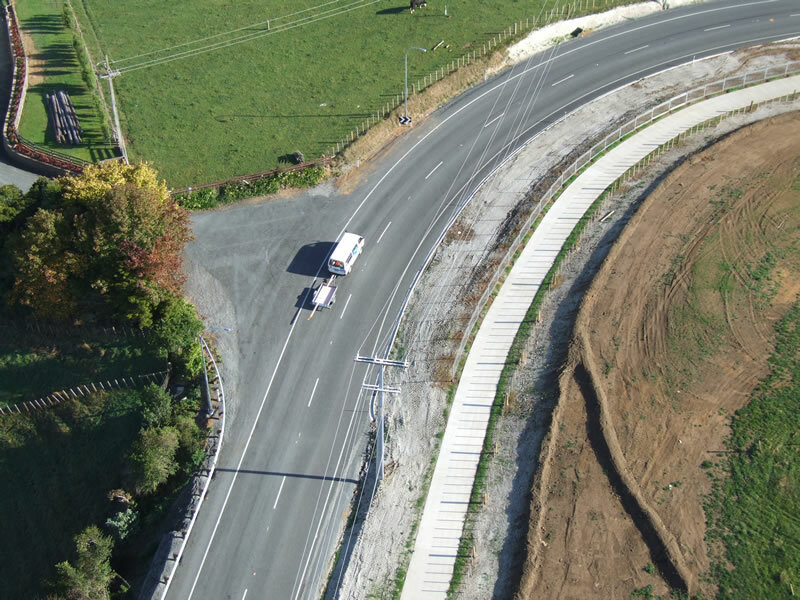 Project Details: This Contractinvolved the upgrade of Te Kowhai & Limmer road to Connect SH39 traffic with the Te Rapa section of the Waikato Expressway. 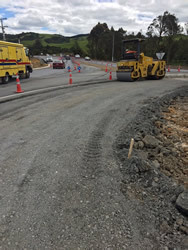 This contract was split into two portions: Portion One - The Alignment Improvements along SH39A, a 4.8Km length section of Te Kowhai/Limmer Road (Between Ngaruawahia and Whatawhata), involved road widening, cement stabilising overlay, curve easing and extensive service relocation work. Portion Two – The safety improvements at the intersection of SH 39 and Limmer Road. Essentially the Intersection control prioritisation has changed in conjunction with improved visibility. There were minimal traffic delays for both portions and we completed the contract on time and on budget. 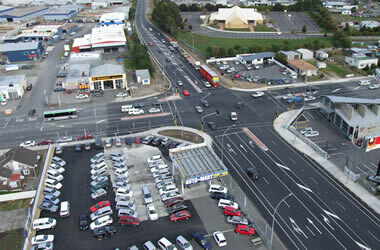 Project details: This contract was situated on the intersection to New Zealand’s largest shopping centre The Base. Traffic count averaged 32,000 vehicles per day. Construction involved removing the existing roundabout, widened the road and rebuilding the entire pavement within the intersection. This provided room for additional lanes and new traffic signals, resulting in improved access to the Base Shopping Complex. The contract also involved service upgrades, footpaths, board walks and safety improvements. There were minimal traffic delays and we completed the contract on time and within budget. 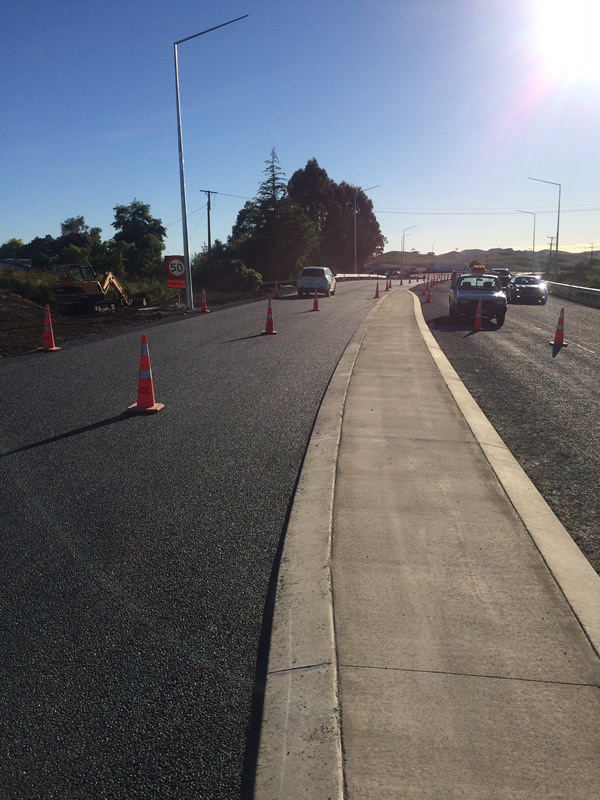 Project Name: NZTA - SH1 Greenwood St / Killarney Rd Intersection Improvements. 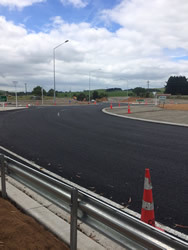 Project details: This Contract was undertaken on the busy intersection of SH1 and Killarney Rd, a busy arterial road for HCC. The contract involved removing the existing roundabout, pavement widening, service relocation, installing traffic lights and a Deeplift pavement. Vehicle Count 28,000 average per day. 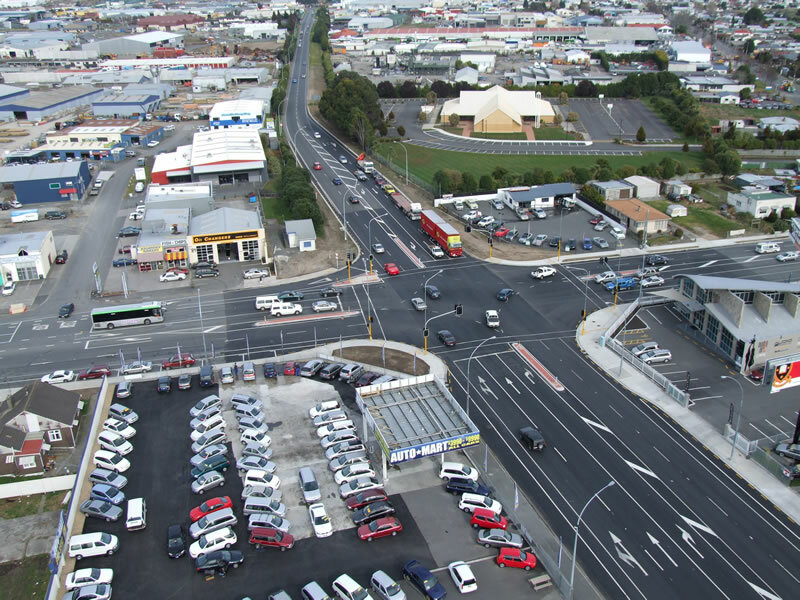 Project Name: NZTA - SH3 Bader Street / Lorne Street Intersection Improvements. 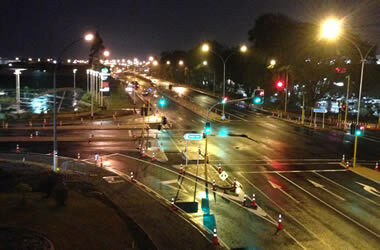 Project Location: Hamilton City - SH1 Lorne Street, SH3 Off Ramp Normandy Ave Bader St Intersection. Project Period: 6 Weeks completed September 2011. Project details: This Contract was undertaken on the busy intersection of SH1 and the SH3 off ramp being Normandy Ave. The contract involved creating an additional Deeplift asphalt slip lane into Bader St and installing Traffic Signals to the intersection. Vehicle Count 30,000 average per day. Project Period: 22 Weeks completed March 2010. 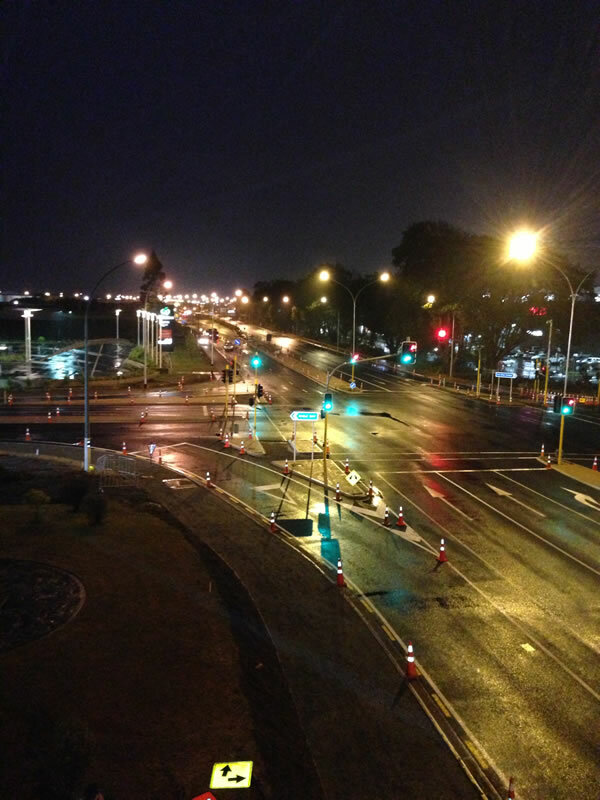 Project details: This Contract was undertaken on one of Hamilton’s busiest intersections outside Waikato Hospital. 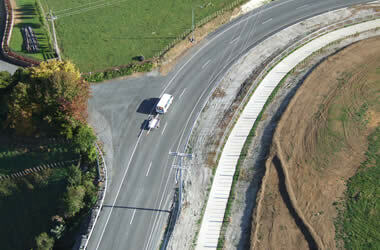 We constructed additional lanes, service relocation, retaining walls, footpath and installed new Traffic Signals. The contract also involved replacing the entire intersection with Deeplift AC and a final SMA PSV 64 layer. Vehicle Count 28,000 average per day. Project Period: 24 Weeks completed March 2007. 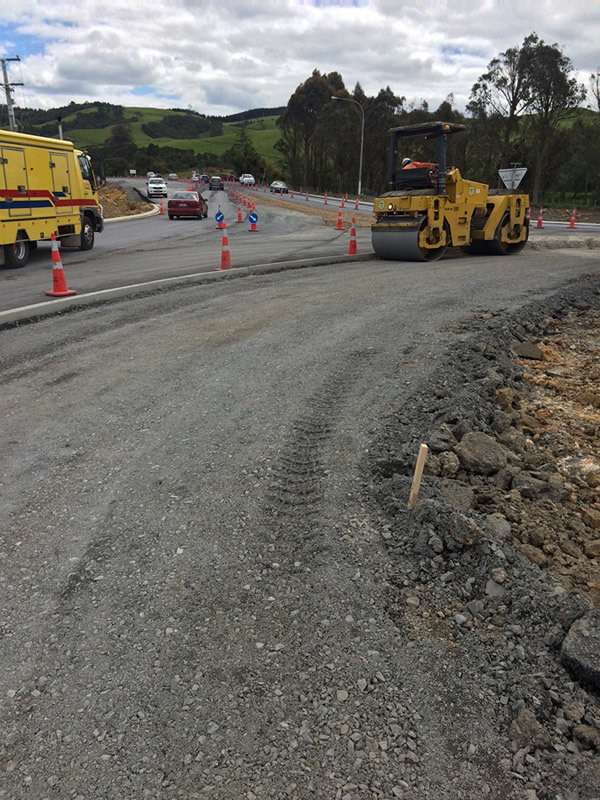 Project details: This project involved the widening of State Highway One from two lanes to four lanes, constructing a kerbed central median and a Stormwater system running down the centre of the road connecting eleven manholes and 30 catchpits. The pavement construction consisted of layers totalling 670mm with chipseal and a stone mastic asphalt. The project also called for an asphaltic concrete resurfacing layer around the busy Church Road roundabout. There were numerous services to move including gas, water, power, Telecom and Clear cables. On its eastern side the highway is adjoined by many businesses. Public relations and liaison has been a big point of this contract particularly as the businesses have had to have services relocated and driveways rebuilt. 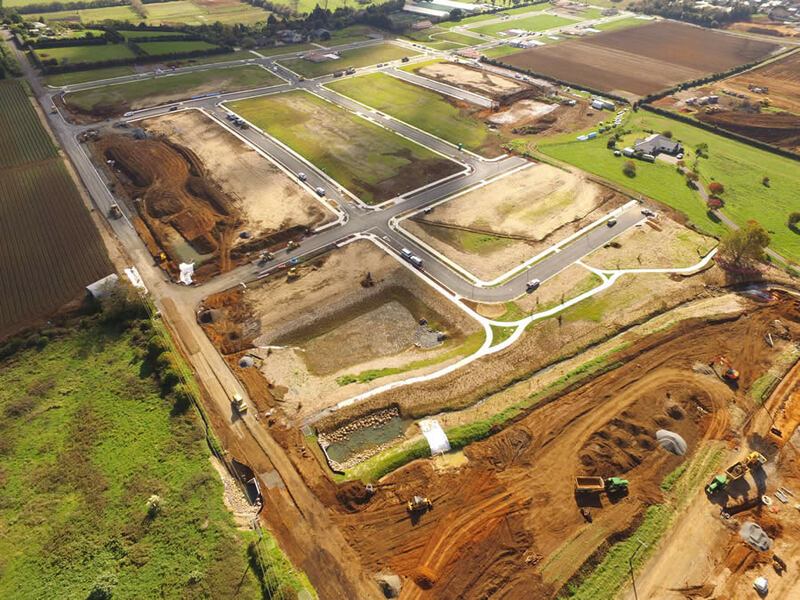 Project Name: The Base Development Te Rapa Hamilton: Various stages from 2005 to 2009 included The Warehouse, Dress mart, Rebel Sport, Hard landscaping throughout the site, Mega 10, Te Kowhai Rd Roundabout. 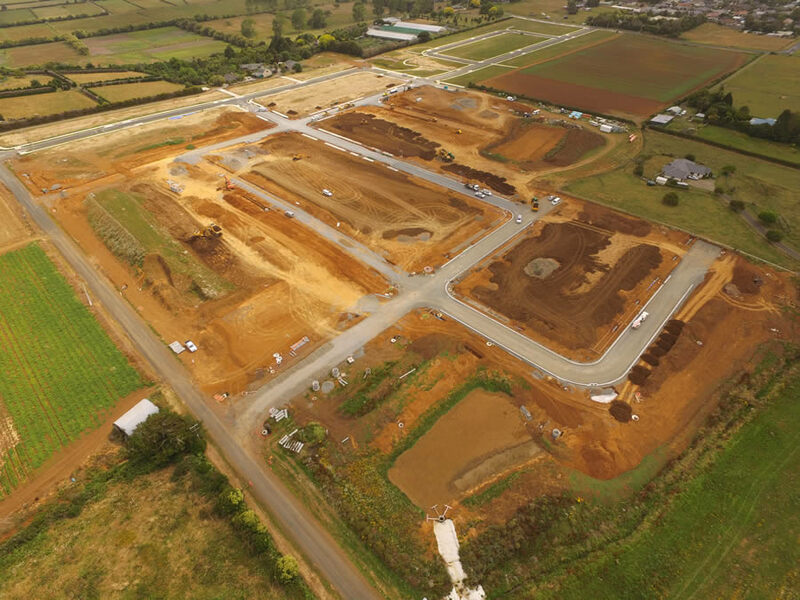 Project Period: Commenced August 2005 and Cambridge Construction has been involved as head contractor on all its stages, work ongoing. Project details: This project involved the development of a retired airforce base for the use of a major retail shopping subdivision. These works entailed major earthworks, clearing and concrete demolition. 2km of internal and external roading , 2000 carparks, 2km of stormwater discharging into a large stormwater pond, 1.3km of deep sewer including pump station 8m below water table involved, building platforms, kerbing footpaths, decorative hard landscaping and pavement surfacing. Including the installation of full services to site, all organised under the umbrella of Cambridge Construction. This project was broken up into various stages. Lot 1 (the Warehouse/Tainui joint venture), Stage 1 (The Warehouse and retail outlet stores). 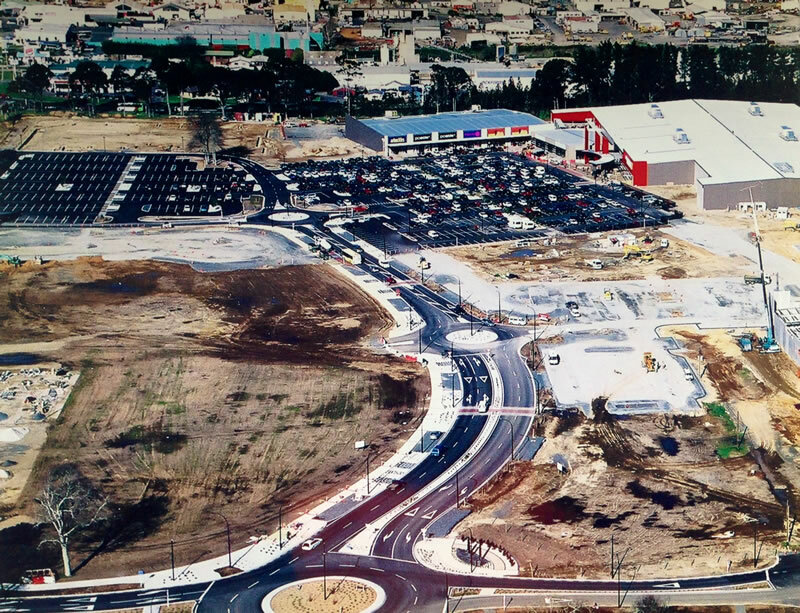 Stage 2/3 additional outlet stores and expansion of roading/carpark infrastructure. Lot 2 Mega 10 Superstore earthworks and clearing (on going project). Stage 3 Heathcotes. Client: Hamilton City Council (“HCC”) and Transit New Zealand jointly. Engineer: Duffill Watts and King Ltd, Hamilton. Project details: This contract has two distinct sections. 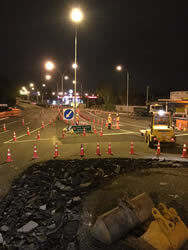 Package One: Required the complete reconstruction of Cobham Drive (SH1) for approximately 150 metres either side of Galloway Street/Hungerford Crescent intersection. 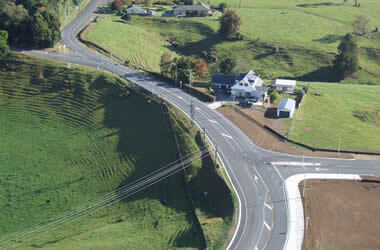 This intersection was improved by the construction of a 36 metre roundabout. New median islands and splitter islands were constructed and new street lighting was provided. Hungerford Crescent entrance to Hamilton Gardens was completely rebuilt and a new entrance and car park were constructed to the Hamilton City Council Nursery. 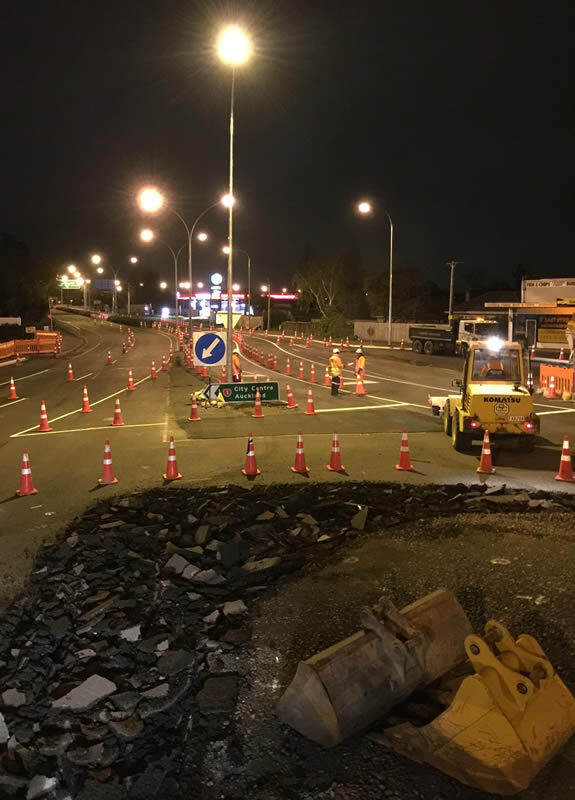 Package Two: Required the complete reconstruction of Cobham Drive (SH1) starting from 250 metres east of Cobham Drive Bridge to just east of Grey Street intersection. 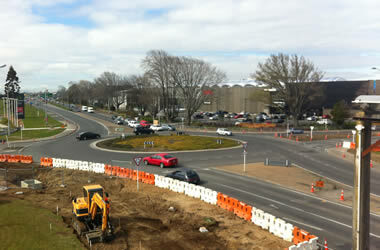 Work included new traffic islands at Grey Street intersection and a new entrance to Hamilton Gardens. Much of the existing carriageway of Cobham Drive was lowered and widened and this material used to construct a structural fill along the Hamilton Gardens frontage. This was an extremely busy section of SH1 with an average daily traffic count of 24000 vehicles. Traffic management STMS (Level 2) was at a very high level and extremely well controlled throughout the contract period. Complaints to the Principals or Network consultants were rare and no incidents or accidents were recorded. We regard this as a fine achievement considering the difficult and complex nature of the work, as well as the high traffic volume. Project Name: SH3 RAB, Te Awamutu four laning upgrade. Project Period: 12 weeks, completed June 2010. 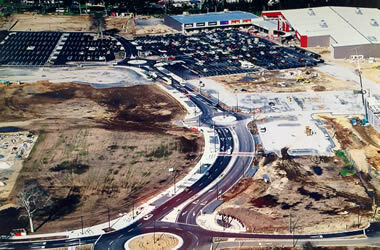 Project details: This Contract was constructed due to a new shopping complex adjacent to the intersection upgrade. 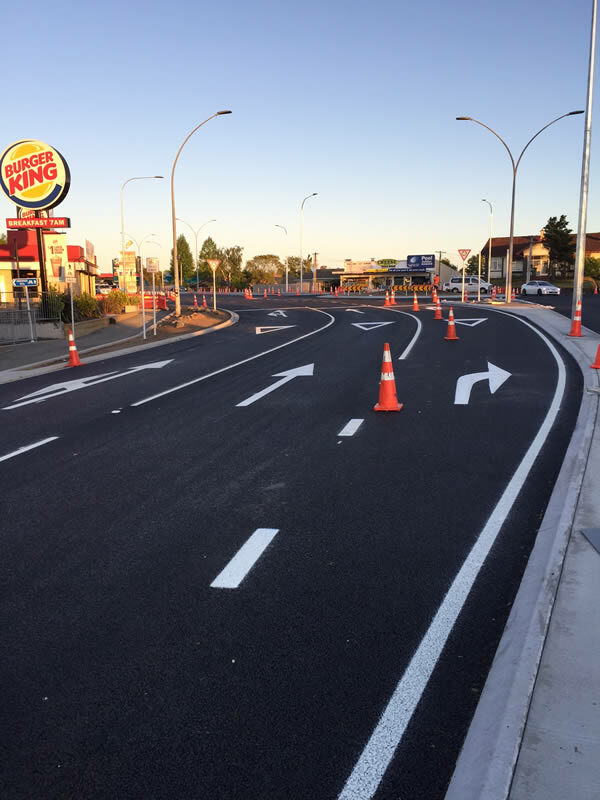 We installed a 4 lane roundabout which involved widening and cement stabilisation and improved pedestrian access, stormwater drainage, lighting and vehicle flow. Vehicle Count 14,000 average per day. 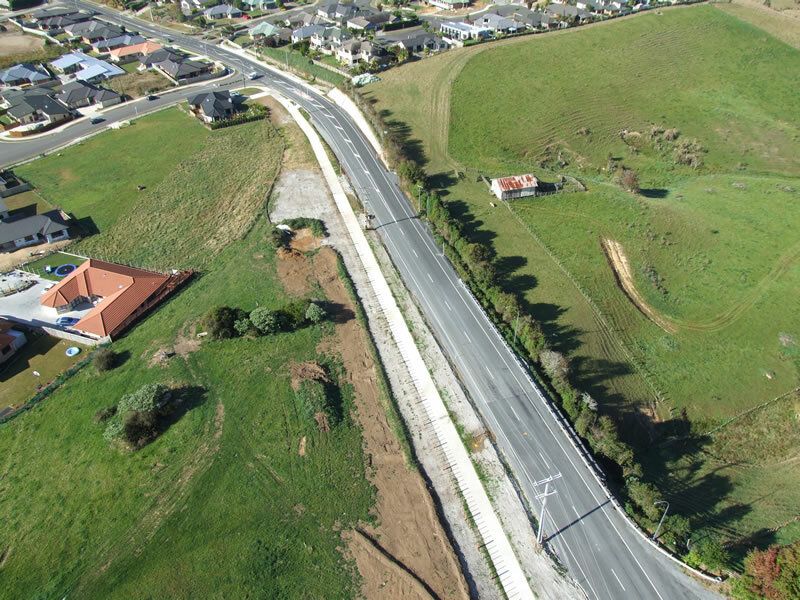 Project Details: This contract involved 1km of pavement rehabilitation and shape correction, including 3m wide footpath, new watermains, stormwater, kerb and channel and new lighting . Project details: Cambridge Construction crew undertook all the earthworks, drainage, and roading. This included 2.5kms of roading involving major safety improvements including overlay, shape correction and widening. 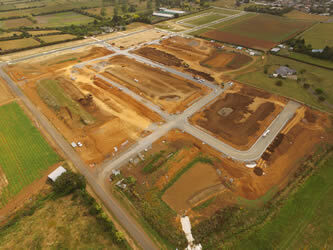 Project details: Cambridge Construction undertook all contract works on Frontier Road. This included 2.2kms of roading involving overlay, shape correction and widening, new footpaths, kerbing and stormwater improvements. Project details: Cambridge Construction undertook all contract works on this contract. This involved a major safety upgrade and widening, including kerb and channel and new lighting. This included 2.2kms of roading over 7 weeks.